We really need to talk about boot trees. A closet that's as equally chic as it is organized? That's the dream—and not one that has to solely exist on your Pinterest board. You can have your fantasy closet, you just need to know the right tips and tricks to make it happen; and no one knows them better than Lisa Adams of LA Closet Design. Lisa turns cluttered, ordinary spaces into luxurious and tailored areas that will inspire you to finally clean out your closet. Her signature in any space is organizing a client's wardrobe so that they can see everything. Lisa often keeps shoes and purses displayed on open shelves, and uses glass cabinets as opposed to solid ones. "If you see everything you have, you'll wear everything," she says. Like items would be displayed in a boutique, Lisa likes to keep everything organized by category and color—casual items together, formal pieces together, outerwear together, and so on. But categorizing clothes is only the beginning. When you're looking at one of Lisa's closets, you're seeing a highly organized and designed space that's built on incredible hidden organization tricks throughout. Lisa shared her favorite tips from a recent project, and—not even being dramatic—they'll change your life. Hang boots. Don't place them on shelves (or the floor). If your current boot storage entails throwing them on the floor of your closet and letting them flap over, you need this instead. Formerly known as boot trees, Lisa swears by these hangers for storing and maintaining tall boots. "Rather than taking up precious shelf space by laying them flat, or causing permanent damage and wrinkles by folding them over, the hanging insert adjusts to the size of any boot and slips nicely over a closet rod to hang," she says. And, if you don't have an existing boot rod already (fair), Lisa says to remove a shelf and swap it out for an adjustable rod instead. Make the most of your space with pull-out cabinets. Lisa's rule: Incorporate this storage fix wherever possible. "It's a great solution to maximize space and keep accessories stored neatly," she says. In this closet, the cabinet pulls out from the wall, and scarves are hanging on rods inside. "We can outfit pull-outs like this to store anything including belts, ties, and jewelry," Lisa adds. Sweaters should be hung properly. As it turns out, there are so many hangers that you haven't been taking advantage of. Lisa actually sells sweater hangers that are designed for storing the delicate clothing items that won't stretch out the shoulders. "Some sweaters shouldn't be folded, but get damaged by standard hangers. These help knits keep their shape without slipping off," she says. 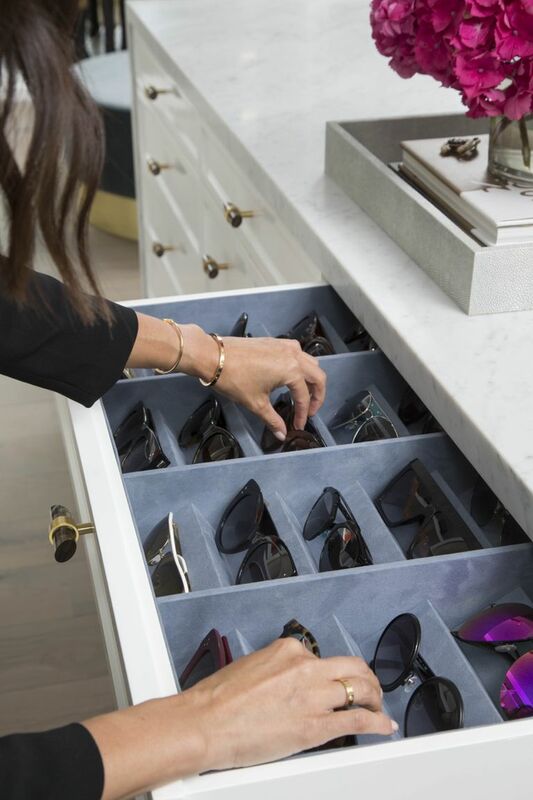 All of the appreciation for this highly-organized sunglasses drawer—which can work for storing multiple types of accessories. Don't have an entire drawer to dedicate? No problem. Lisa makes custom acrylic vanity trays with the same inserts. "You can get the same custom look without sacrificing space in a drawer," she explains. And, since the tray is mobile, it can work in an entryway, office, or on a nightstand.